I need a “new” car. I’ve been “into” cars since I was 15 or so. By the time I hit 15, I had been driving all the back roads in my small Arizona mining hometown of Miami for about a year and a half — lots of dirt roads and one old pickup means a lot of fun. I got to reading about racing, got into Formula one (still am), followed drivers, and fell in love with old cars. My uncle had an old VW that I started wrenching on; that and my first real car (Fiat 131) and began to make the whole experience real. Trouble was twofold; the Fiat was new, and my dad bought it. I needed something that was mine. 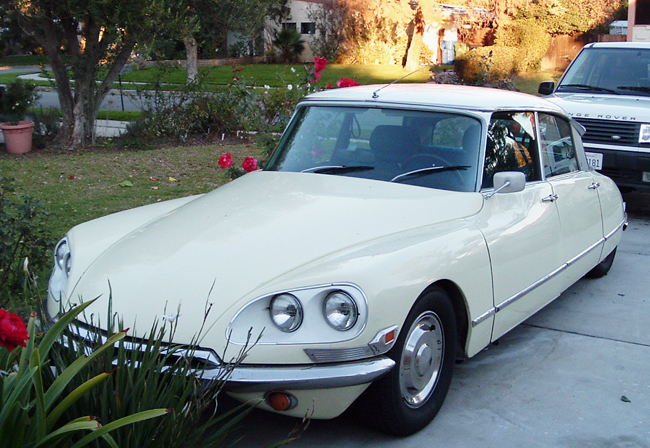 With the first $350 I made the summer of my freshman year in college, I bought my very first old car, a Citroen DS, simply because it was different. I’ve had at least one old car in my garage ever since, mostly Citroens but a few other glorious standouts. Another Citroen DS — I have to admit to a very quirkly and possibly misguided love affair with these cars. I’ve had 10 Citroens now, and I’ve restored most of them to near-showroom condition and have put more miles on them than most frenchmen. Being an engineer, I have yet to see anything that really screams engineering like a DS — 911’s are close and possibly better built, but the DS was and in many ways still is the car of the future. A car that had everything pretty much justified, engineered and added only after it had purpose. There’s very little on a DS that is put there just for looks. They are solid, original and when maintained properly, absolutely bullet-proof and reliable. I always felt that I’ve “left something on the table” with the restorations that I’ve done on these cars. If I could find the “right one”, I think it would be my hands-down favorite. Alfa-Romeo 2600 Bertone Sprint — The least-loved of the “big” Alfas, the Sprint Coupe is really a great car. The six-cylinder motor is familiar to the two 3500 Maseratis that I’ve done in the past, as well as most of the bits in the car are from Italian parts bins of the era, which I have great familiarity with regards to the aforesaid Masers, one Iso Rivolta and a Alfa 101. These guys can be had fairly inexpensively, and although a restoration would be challenging, the final result is something that I would dig driving to work a few times a month. 1964 Corvette Coupe — Probably one of the cheapest to really restore well, they cost a fortune to obtain. I don’t want one of those big-block monsters with all the go-fast goodies — A nice 327-340 engined set-up with an Automatic and Air, well, that’s fine with me. Silver/red interior? Maybe Yellow/white? The second-series vette is the ultimate cool car, the 327 to me is the ultimate small-block, and the Automatic/Air combo is the ultimate road-tripper/commuter/arrival car. Gotta make me some more money before I can throw down for this one! Porsche 356-A coupe — Going fast isn’t all about ponies. Going fast is also weight and cornering. While the 356 is definitely a vintage car, I’ve driven quite a few of these over the years and two things come to mind. They are just stupid-fun quick, even if you’re the only one that knows you’re going fast, and they are really well made. There are parts galore to make your car anything from a Concours Lawn Bird to a Sleeper Hot Rod; Porsche likes to race and the go-fast factory parts are just bitchin’. I’ve had two 911s, but I would love to have a Semi-Sleeper A-series Coupe. 1967 Porsche 911s — I had one of these about 10 years ago. I had really been into Italian cars for years, thought Porsches were over-glorified and just too ubiquitous. That is, until I drove a ’67 S to its factory 8000 RPM red-line. OhmyGODnobodytoldme that a car could pull through 5th gear like that! Sold. I lost that car to trailing-throttle oversteer one dark night. Even though it rolled 1 1/2 times I was still able to drive it home. Just couldn’t fix it. Now I know why they lengthened the wheelbase a few years later to make it at least less squirrely. The early 911s are just so well-made and yet so light and airy. It seems like the builders took a block of steel and carved away everything that didn’t look like a 911. The thing that upset me about the early cars was you couldn’t put a decent stereo in it. Being in my 40’s, I only listen to PBS and old stations anyway, and the interior noise in that car really doesn’t make a large investment in sound equipment a realistic idea. There are others — another ISO Rivolta, a really early Facel-Vega FV, possibly another 101 Alfa or a mid-60s two-headlight Giulia Sprint GT — I may hit the lotto and really step up to something that would cost more than my house, but I really don’t see that happening — I’ve got a kid to educate, a wife to be happy with and lots of other things to do. Still, there’s a part of me that misses my old iron, the insane pleasure I get from restoring old cars, and the zen-like pursuit of an unobtainable perfection that keeps one grounded and centered. I want to thank HNM3 and the other writers at R&T for their writing, my Uncle Moon for giving me the confidence to turn a wrench on anything, and my wife for smiling and not saying “no” as much as she should. Since I haven’t narrowed the car down to one, I’m going to keep looking until I do. That may end up being more fun anyway. update –> 1/9/2008 read about what I finally did. I love hearing about people’s passions for old cars. Growing up, I didn’t have as a positive influence in my life for working on cars. I just thought the mechanic at the local shop was cool with his sideburns and his Corvair Truck was. Then when I was about 15 or so, I met a guy in my ‘hood who’s dad was a real greaser. I thought he was the coolest. The three of us built a rail out of a 1971 Super Beetle. We forgot to tighten the lugs on the thing on our maiden voyage. His Dad realized our mistake and simply followed us with a lug wrench knowing we’d eventually pull over. That’ll teach us! It was in that Bug we spun out doing three 360’s and over into a ditch on our way to a Sha-Na-Na concert which happened to be Bowser’s farewell performance. sniff sniff. My first real job was in a pizzeria and all the drivers had hot rods; 1971 Thunderbird, 1970 Chevelle, 1973 Trans AM, Camero’s, Nova’s and all kinds of stuff. It was great. My friend Bart had a ’65 Chevelle Malibu all tricked out. Lots of good memories! Now, I’ve got my Grandmother’s ’68 Chevelle, waiting to be restored with me and the kids, and I also enjoy the engineering of the cars. For example, in our 2003 Eurovan, there is something about the door hinges. I don’t know… it’s the way they are machined and painted… they are just nice to look at. I am constantly comparing them to the hinges in the Volvo (one of which broke and creaks and snaps!). Great post! Thanks for the memories. German, because anything they build seems to have that feeling of being carved from a single block of steel. French, because they think out of the box, have an overwhelming need to be technological trend-setters, and finally Citroens. Gotta like them Citroens. I plan on posting a whole blog story about them at some point. Oh, and Facel Vegas my favorite car ever. Finally Italian Cars are probably my favorite. Never in the lead technologically, they seem to prefer to really get a proven technology as right as they can. Plus, I’m quite willing to put up with little reliability issues as long as it’s part of the “dolce vita”, like blasting your Veloce around a canyon to keep the engine running right, dealing with a Maserati that has “bbs” in the head gasket to keep it from crushing the fire rings, and triple-shoe front drum brakes. No matter what it is, it is always executed with style. As I get older, I’ve developed a fondness for the Detroit Iron as well. I think it has a lot to do with nostalgia for the simple times of my youth and the local heros that I knew that always seemed to have a V8 torn down in a garage somewhere, or the admiration of keeping something simple, designing it specifically for the user and the roads they would be used on, and making it reliable. you’ve got to go with the corvette.sounds like you’ve tried everything else but an american made car. Color: white (Ivory), in great state, from engine is changed just accumulator and rings, first color, first owner, driven 105.000 km. As you can saw from the pictures, factory bandage is still there, what is proved for it’s health and safety state. The interior is red, and are used cover for it’s protection. As we mention, all parts are original. Since today, car is garaged, which represented it’s good state. There is no part of car under corrosion, doors are closed perfect. Also, windows functionality is great. The future used of this car is more assign as antic, rather than driving. Hello! My name is Marian and i’m from Macedonia (FYROM). My grandfather having Fiat 1300 and is in very good condition and is very preserved Produced in Kraguevac (Serbia) in 1965. do You want some of the pictures,and it’s for sale.